The following forms/templates have been updated and are available to download below. Please ensure that these versions are used from this point onwards. Wording - removed all references of "statement"
Health and Social Care Questionnaire - this questionnaire will provide support to Health and Social Care professionals so that they can triage and sent to appropriate teams who will then provide us some advice. Provision Map - we have removed this and replaced this with a Summary of Intervention (description is on the summary). Sign off sheet - added a separate boxes so that you have to make it clearer whether you are changing needs/provisions and outcomes. If there are changes then we may want to consider changing them at the next Key Stage Transfer - wording has been added to ask this question and added the views of the parents/YP separately. Consent - we have added some notes on to consent so that parents are aware that they are giving us permission to assess their child and obtain reports as part of the assessment. Electronically - we need this electronically in a word format to support us when there are changes to the EHCP. Provision Map - we have removed this and replaced this with a Summary of Intervention. Description is on the summary. If you have any enquiries about the forms please contact the SEND Team. 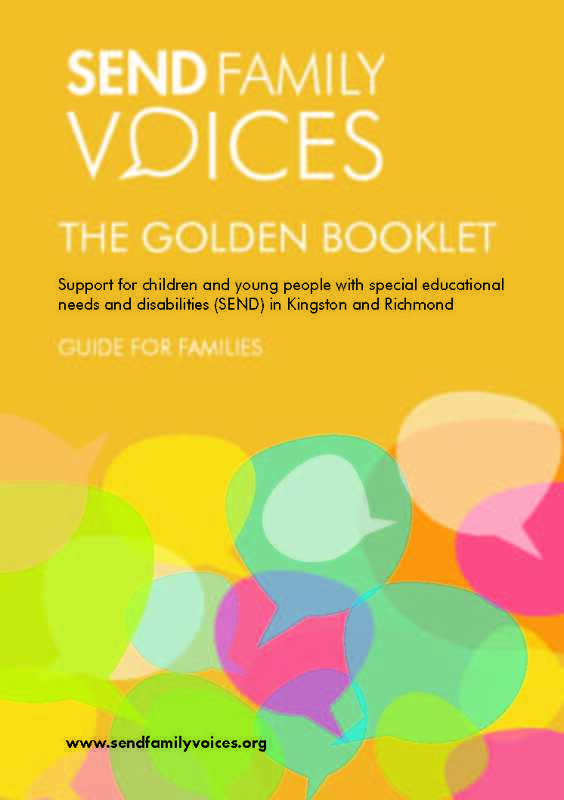 A resource has been created by the Parent Forum working with Achieving for Children (AfC) and representatives from Health, Social Care, Schools, Early Years and Post 16 to create a complete set of guidance documents relating to “Support for children and young people with special educational needs and disabilities (SEND)”. The resource is nicknamed the “Golden Binder”. Every Early Years setting, school SENCo and special school in Richmond and Kingston should have a copy, as well as all key professionals involved with the EHCP process. The resource can be viewed and downloaded from this page. The content in the binder is jointly owned by a group of professionals, parents and AfC staff who are jointly responsible for keeping it up to date and ensuring that any changes are made with the knowledge and in consultation with all the other teams and functions that are involved. If you have any comments or feedback on the guidance in these chapters then please use the Local Offer "Contact Us" page to feedback. The comments will be reviewed and changes made twice a year. The Golden Booklet is the shorter, easy read version of the Golden Binder. PM - Provision Map - to be used to support needs assessment requests and/or to support the request for additional provisional during an annual review. Forms numbered NA1 - 4 above are for requesting an Education, Health and Care (EHC) Needs Assessment for the first time. The separate Provision Map - Form PM should be used to support a needs assessment request. The following Education, Health and Care Plan templates are to be used by SEN, Education, Health and Social Care professionals and to be completed with a family once it has been agreed that a plan is needed. The following templates and forms are to be used during an annual review. ​PM - Provision Map - to be used to support needs assessment requests and/or to support the request for additional provisional during an annual review.